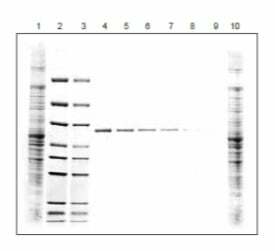 eStain L1 is a highly efficient protein PAGE gel staining system, which uses Coomassie Brilliant Blue and a patented protein staining technology developed by Genscript. 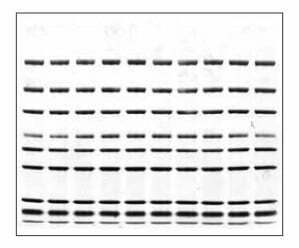 eStain L1 staining system integrates the traditional three steps of fixing-staining-destaining into one and can stain/destain two protein PAGE gels simultaneously in 10 minutes or less. eStain L1 works with all types of precast as well as homemade PAGE gels. Compared with the conventional staining methods, gels stained by eStain L1 have crisp blue bands with minimum or no background. 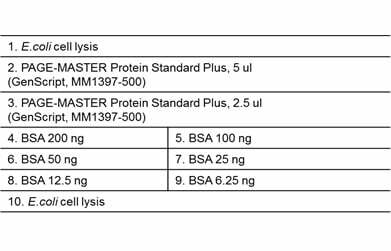 eStain L1 also offers superior sensitivity compared to conventional methods and can detect as low as 12.5 ng of protein.